More Evidence Links Marijuana Use And Psychosis : Shots - Health News As more places in the U.S. and Europe legalize marijuana, weed consumption is growing ever more popular. But researchers are studying a troubling health risk associated with the drug. Several past studies have found that more frequent use of pot is associated with a higher risk of psychosis — that is, when someone loses touch with reality. Now a new study published Tuesday in the The Lancet Psychiatry shows that consuming pot on a daily basis and especially using high-potency cannabis increases the odds of having a psychotic episode later. 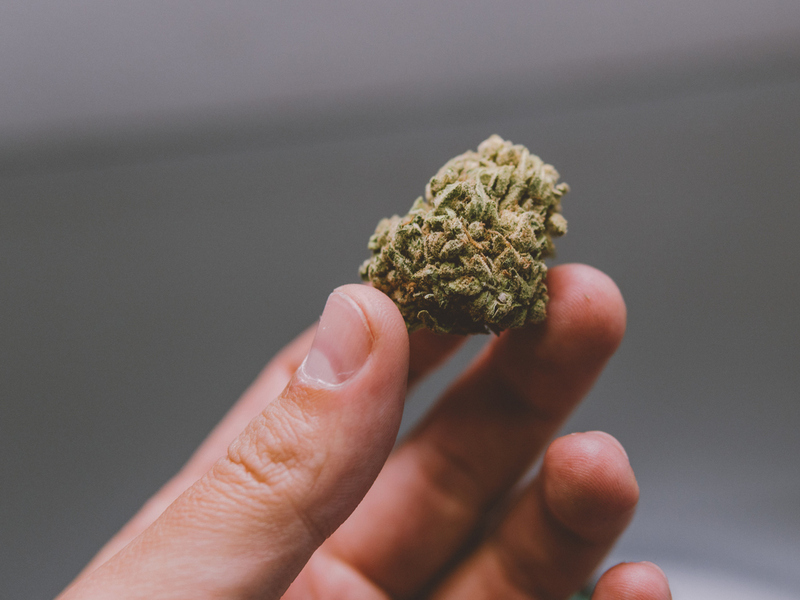 "This is more evidence that the link between cannabis and psychosis matters," says Krista M. Lisdahl, a clinical neuropsychologist at the University of Wisconsin, Milwaukee, who wasn't involved in the study. The study authors consider high-potency cannabis to be products with more than 10 percent tetrahydrocannabinol or THC, the compound responsible for the drug's psychoactive effects. The fact that consuming high-THC cannabis products has a greater risk is concerning, Lisdahl says, because these products are more common in the market now. The study also shows that three European cities — London, Paris and Amsterdam — where high-potency weed is most commonly available actually have higher rates of new cases of psychosis than the other cities in the study. The researchers identified 901 people aged 18 to 64 who were diagnosed with their first episode of psychosis between May 2010 and April 2015, at a mental health facility anywhere in 11 cities, including London, Paris, Amsterdam, Barcelona, other cities across Europe and one site in Brazil. The researchers then asked these individuals and a control group of 1,200-plus other healthy people about their habits, including their use of weed. "We asked people if they used cannabis, when did they start using it and what kind of cannabis," explains study author Marta Di Forti, a psychiatrist and clinician scientist at King's College London. People reported the names of weed strains they used, such as skunk in the U.K. or the Dutch Nederwiet, which allowed the researchers to identify the THC content in each product through data gathered by the European Monitoring Center for Drugs and Drug Addiction and national data from the different countries. The study found that those who used pot daily were three times more likely to have a psychotic episode compared with someone who never used the drug. Those who started using cannabis at 15 or younger had a slightly more elevated risk than those who started using in later years. Use of high-potency weed almost doubled the odds of having psychosis compared with someone who had never smoked weed, explains Di Forti. And for those who used high-potency pot on a daily basis, the risk of psychosis was even greater — four times greater than those who had never used. The easy availability of high-THC weed is a recent phenomenon, she notes. "Almost 20 years ago, there wasn't much high-potency cannabis available [in the market]." One recent study showed that high-potency cannabis is increasingly dominating markets. It found that the average potency of weed in Europe and the U.S. in 2017 was 17.1 percent, up from 8.9 percent in 2008. And some products can be even more potent. For example, in the Netherlands, the THC content of one product that's gained popularity, locally produced Dutch resin Nederhasj, can be as high as 67 percent. "What this paper has done that's really nice is they look at rates of psychosis and cannabis use in lots of different places where underlying rates of psychosis are different," says Suzanne Gage, a psychologist and epidemiologist at the University of Liverpool, who wrote a commentary linked to the study in The Lancet Psychiatry. This allowed the researchers to compare incidence of psychosis with the availability and use of high-THC cannabis in the different cities, she says. These are also cities where high-potency weed is most easily available and commonly used. "One of the things that's really novel is that they could show that variation of use and potency of cannabis was related to rates of first-episode psychosis," Lisdahl says. One critique of the theory that weed contributes to psychosis risk has been that while more people are using weed worldwide, there hasn't been a corresponding rise in rates of psychosis, Gage explains. But the new study shows that cities with more easily available high-THC weed do have a higher rate of new diagnoses of psychosis. "That's a really interesting finding, and that's not something anyone has done before," she adds. However, the study doesn't prove causality, cautions Dr. Diana Martinez, a psychiatrist and addiction researcher at Columbia University. "You can't say that cannabis causes psychosis," she says. "It's simply not supported by the data," she says. Lisdahl agrees. In order to show causality, one would have to follow people over time — before they started using weed to years later when they have their psychotic episodes, she says. "You need twins in the studies, you need genetic information," among all other kinds of data, she says. Psychotic disorders such as schizophrenia and bipolar are complicated, "multifaceted disorders," Gage notes. "In all psychotic disorders, there is this multiple hit hypothesis," Martinez says. Many factors influence whether and how these disorders manifest. Genetics is known to play a major role, as are a host of environmental factors. "Children who have risk of schizophrenia but grow up in stable homes ... they may not go on to develop schizophrenia," she adds. The Adolescent Brain Cognitive Development study, which is funded by the U.S. National Institutes of Health, is attempting to tease out the various influences, Lisdahl says. "The NIH has now invested in that question." In the meantime, the new findings should be of interest to anyone using cannabis, says study author Di Forti. "There are people across the world who use cannabis for a variety of reasons," she says. "Some of them recreationally, some of them for medicinal purposes." They should be aware that using high-potency cannabis comes with a risk, she says. "They need to know what to look for and ask for help, if they come across characteristics of a psychotic disorder," she adds.